The news media's credibility is sagging along with its revenue. The poll didn't distinguish between Internet bloggers and reporters employed by newspapers and broadcasters, leaving the definition of "news media" up to each individual who was questioned. The survey polled 1,506 adults on the phone in late July. The survey found that 63 percent of the respondents thought the information they get from the media was often off base. In Pew Research's previous survey, in 2007, 53 percent of the people expressed that doubt about accuracy. The findings indicate U.S. newspapers and broadcasters could be alienating the audiences they are struggling to keep as they try to survive financial turmoil. Pew Research didn't attempt to gauge how shrinking newspapers, reduced staffs and other cutbacks at news organizations are affecting people's perceptions, although the reductions probably haven't helped, said Michael Dimock, an associate director for the center. The financial problems mainly stem from a steep decline in the ad sales that generate most of the media's revenue. Newspapers' print editions have been losing readers to the Internet, and broadcasters' audiences are fragmenting in an age of cable TV and satellite radio. Newspaper ad sales plunged by 29 percent, or nearly $5.5 billion, during the first half of this year, according to the Newspaper Association of America. TV ad revenue on broadcast stations dropped by 12 percent, or nearly $3 billion, during the same period, according to the Television Bureau of Advertising. Radio advertising fell by 23 percent, or $2.3 billion, according to the Radio Advertising Bureau. The budget squeeze "means facts don't get checked as carefully as they should," according to Bill Keller, executive editor of The New York Times. But he still believes many media outlets still go to great lengths to get the facts right and own up to their mistakes when the information is wrong. "The great flood that goes under the heading `news media' has been poisoned by junk blogs, gossip sheets, shout radio and cable-TV partisans that don't deserve to be trusted," Keller told The Associated Press in an e-mail. The Internet also has made it easier to research information and find errors in news stories, said Kathleen Carroll, the AP's executive editor. And the Web's discussion boards and community forums spread word of mistakes when they're found. Carroll hopes the increased scrutiny and accountability fostered by the Internet will lead to better journalism. "We're in the early stages of a changing relationship between news organizations and consumers, who are becoming much more vocal about what they like, what they don't and what they want to know," Carroll wrote in a statement. "It's not always pretty or pleasant, but that engagement can and does help improve coverage." The public's trust in the news media began to deteriorate long before the industry's finances began to droop and the Internet hatched more competition  as well as more gossip and speculation. With few exceptions, the news media's credibility has been eroding since 1985. Back then, 55 percent of the respondents believed newspapers and broadcasters generally got things right. By 1999, the figure had fallen to 37 percent. The only time the Pew survey recorded a significant shift in the media's favor was in November 2001, when 46 percent said they believed news stories were accurate. Dimock attributes the anomaly to the sense of goodwill that permeated the United States after the September 2001 terrorist attacks. Similarly, only 26 percent of the respondents said the press is careful to avoid bias. The figure was 36 percent in 1985. A decade ago, only 6 percent of the survey participants said they leaned on the Web for their national and international news while 42 percent relied on newspapers. (TV also led in 1999, at 82 percent). The poll didn't try to determine whether the people who cited the Internet as their primary news source were reading Web sites run by newspapers and broadcasters. Television also is the leading outlet for local news, with 64 percent relying on that medium. Newspapers ranked as the second-most popular source for local news at 41 percent, trailed by radio at 18 percent and the Internet at 17 percent. In this case as well, people could name more than one source. Even as more people than ever don't believe everything in the news, Pew found that the public still seems to value the media. When asked how they would feel about a news outlet closing, 82 percent said it would be an important loss if there were no local TV news and 74 percent said it would be a major blow to lose their local newspaper. 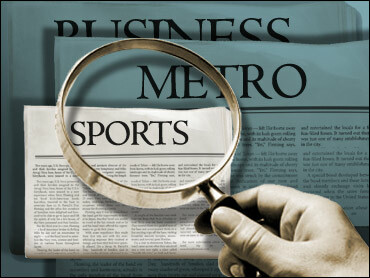 Keller suspects many people cherish the newspaper they read or TV news program that they watch. "Just as polls routinely show that people hold Congress in low esteem but tend to like their own congressman, I think the public is suspicious of the media in general but tends to trust the particular news organization they turn to for news," Keller wrote.